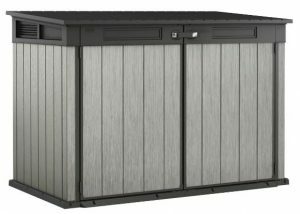 Assembly made easy, the Grande-Store swiftly constructs to deliver a low-profile triple wheelie bin storage solution, encased in Duotech’s silver-styled weather-resistant resin. 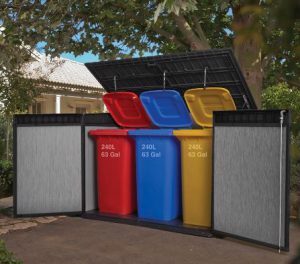 Providing low-maintenance the Grande-Store not only fulfils generating a recycling station for your backyard, it’s extremely versatile. Catering as a gardening equipment facility, a bike-park for two adult bikes with 2 kids bikes, an outside toy-shelter, a place to harbor away patio necessities & barbecue paraphernalia, sporty stuff, work tools or a dry-log store for wintertime convenience; summarises just a few alternative storage ideas. 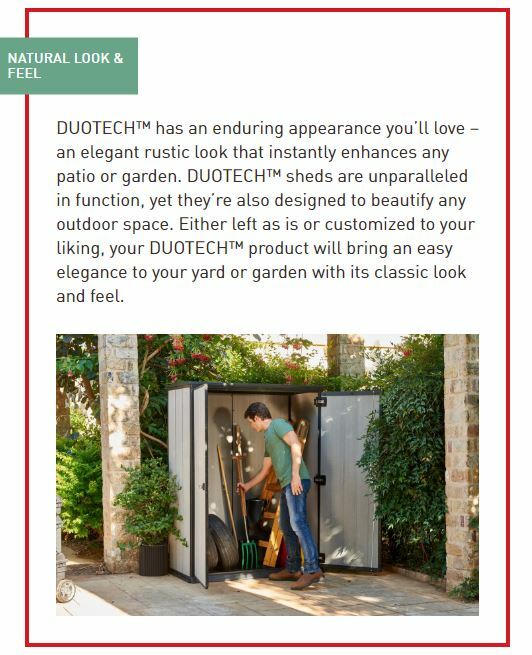 Since Keter’s state-of-the-art Oakland sheds entered the market, feedback’s been outstanding, resulting in expanding their DUOTECH™ range across multiple outdoor storage solutions from deck boxes, high stores and low height facilities like this Grande-Store. We departed the wooden shed world due to constant yearly upkeep battles & re-roofing dilemmas. Replacing with Duotech material substitutes associated hours of servicing rot & re-varnishing with the few minutes operation of a light pressure-hose down. Expanding 6 ft wide, 3½ ft deep and 4 ft high provides the solution to hide-away unsightly wheelie bins, the weathered silvery tones exhibit modish eye-appeal to compliment outdoor spaces whist the recyclable material is not susceptible to decomposing. Enhancing Grand-Store’s voguish appearance & weather-resistance, the fascia is formed into double lined panels for robustness, further fortified by a steel infrastructure. 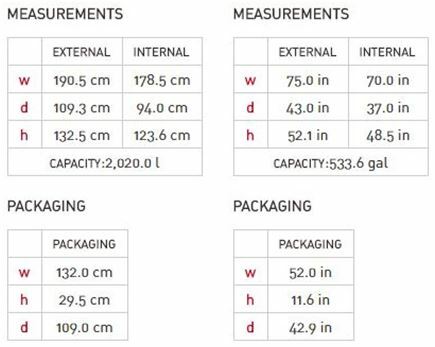 The spacious internals enable storing a variety of storage including wheelie bins: Measure your trash-bins & storage ideas with the internal measurements presented within this post to ascertain they fit-in. Facilitating wheelie bin services, a lid-lid chain opening kit is supplied. The chains attach the bin lids to Grande-Store’s lid resulting in all bins opening together when the Grande-Store lid swings ajar, thereby enables hygienically disposing rubbish hands-free. Air vents situated either side disperse waste-odours by continuously distributing a throughput of fresh air meantime prevents sweaty saturated environments arising inside. Hydraulic pistons ease the lid operation whilst broad double doors across the front provide fab. A heavy duty floor comprising a sloped entry threshold cater for storing burdensome trash loads and ease wheeling the weights inside & out. Paintable DUOTECH™ walls cater to customise the facility in any desired shade to blend in with the accents of garden surroundings, meanwhile, if a stylish patio storage solution lights your candle, shelf supports are provided for fitting a shelf to accommodate additional accessories. The fascia comprises tongue & groove edges which streamline assembly albeit there are huggings of screws meanwhile a stainless steel locking mechanism and padlock-style handle deliver security. The fascia constitutes two separate panels joined together by an internal corrugated structure whilst steel reinforcements brace the construction, resulting in a sturdy finish, resistant to dents. Simulating the rustic appearance of weathered wood courtesy of silver pigments mixing in with the recyclable polypropylene, the molding procedure forms deep textured grain to the touch meanwhile additional UV inhibitors armour the make-up to impede the scorch of sun-rays blistering the manufacture & bleaching colours. Unsusceptible to corrosion & rot the makeup’s designed to endure all weather-seasons including driving rain, continuous damp, snowfall and sweltering heat without suffering any alteration to the manufacture, meanwhile, freshening-up appearances is accomplished by the most basic of cleaning procedures. We typically click the shower connector into the hosepipe, turn the nozzle to jet and speedily wash the fascia. The most popular method regards a light pressure-wash whereas using a bucket of warm water, a soft brush & a squirt of detergent is a great tip for removing ingrained moss. DUOTECH™ manufacture caters for customising. Boasting a paintable surface courtesy of incorporating resin-talc enables decorating your preference of colours to brighten-up the home-yard using acrylic emulsion (usually termed bathroom & kitchen paint in DIY stores) or you can simply leave the wondrous rustic charm the way it displays. Access into the Grande-Store couldn’t get much easier. A sloping threshold incorporates at the entrance to assist wheeling bins inside or parking the lawnmower whilst broad twin doors spanning the width open wide, providing oceans of room for manoeuvring sizeable bins. The double doors are composed of identical DUOTECH™ material as the fascia whilst the roof’s whopping 6 ft x 3½ ft expanse comprising a back polypropylene manufacture inclusive of weather-resistant additives; opens-up to facilitate easygoing wheelie bin access. The lid’s 100% reusable manufacture is impermeable to rainwater and delivers imperishable weather-defence irrespective of conditions meanwhile designed with a slight angle effectuates an efficient rainfall drainage system. Lifting the hefty top is assisted by hydraulic pistons meanwhile the pressure also steps in to soft-close the lid, preventing it from crashing down. You’re provided with chains that attach the bin-lids to Grande-Store’s lid to enable hands-free refuse disposal, hygienically opening all lids simultaneously as represented in the wheelie bin images up above. The padlockable stainless steel locking mechanism secures both doors & lid together, accomplishing triple door security. 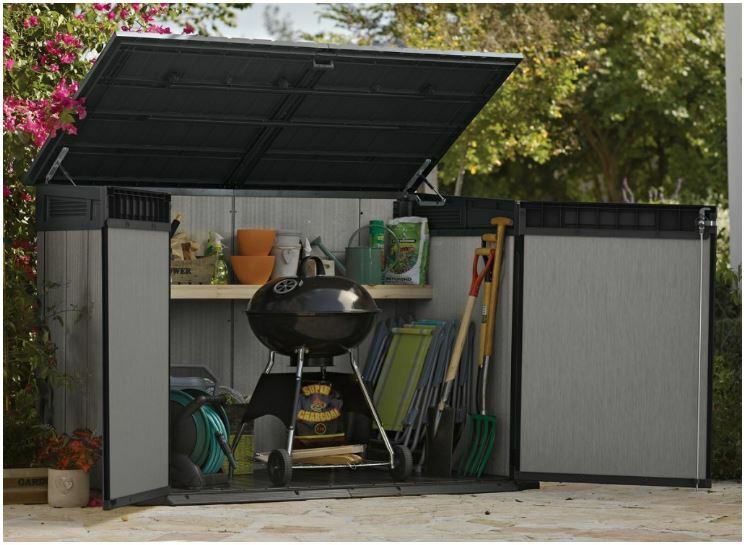 The Grande-Store offers a variety of outdoor storage solutions from stylishly hiding unsightly wheelie trash bins, parking bikes, accommodating sports stuff, an outside toy-shelter to occupying gardening equipment & lawn supplies or perhaps a smart looking low height storage facility for patio accessories. 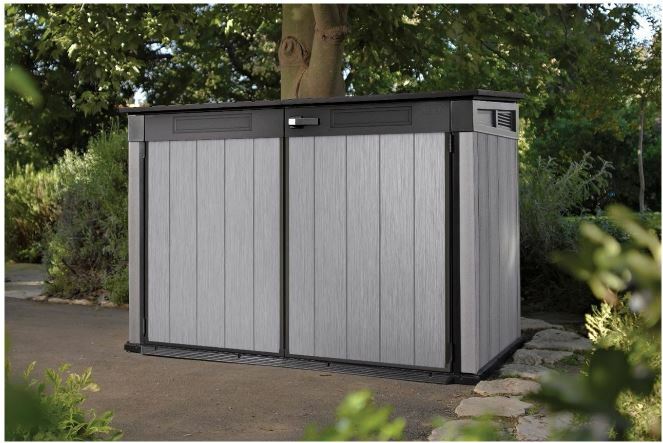 It’s becoming more common to see a few horizontal stores occupying home gardens nowadays due to stricter planning regulations regarding walk-in sheds in certain areas plus many prefer this easy installation method besides the way low-profile units station below the standard 6 ft fence-line. 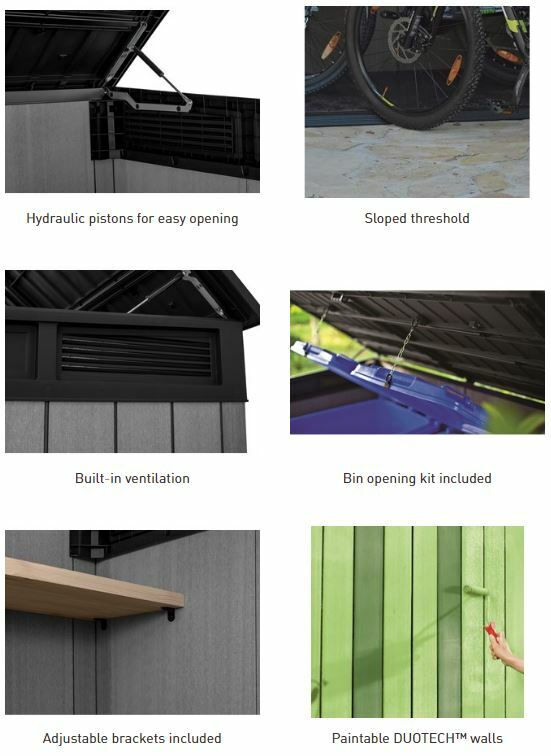 Integrated into the shed, the floor helps maintain a clean environment courtesy of the fascia-panels interlocking within the perimeter, preventing gusts of wind blowing debris inside, critters finding entry and rainfall puddling the shed floor whilst the muscular thickset resin manufacture is purposely designed to subsist the tensions of wheelie bins and storing weighty equipment. Air vents positioned either-side generate a current of fresh air to repel refuse odours and prevent saturation arising during clammy conditions, thereby preserving storage if used for other purposes. This store will either accommodate two 96 GAL / 360 Litre wheelie bins or three 63 GAL / 240 Litre wheelie bins. Brackets are included for installing your own wooden shelf whilst cutting measurements are detailed in the instructions. Thick plywood purchased from local hardware stores make suitable shelving if intentions are to be used for alternative garden storage. The benefits of a resin manufacture relate to their weather-resistant advantages. 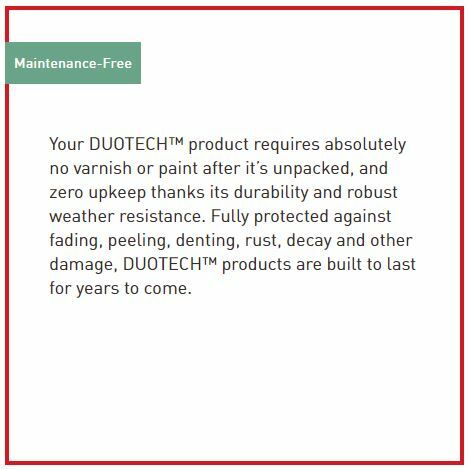 Duotech material does not rust or rot and is immune from decomposing leaving the mere maintenance as a wash down when mucky to freshen back the pristine appearance that lies beneath. Hosing down our resin shed with a jet-spray is a job I’ve come to rather enjoy, a few minutes later the new look shines back through, making a doddle out of maintenance. This make-up doesn’t require constant upkeep associated with re varnishing, servicing rotten wood and re-roofing; hassles to which disintegrating roofing felt is prone to, being susceptible to weather decay. If you decide to paint the silver fascia however, this will inevitably fade and require a re-coat stood outside. Whenever ingrained dirt becomes hard to shift, we find a bucket of warm soapy water & soft bristled brush swiftly removes, albeit this is only once in a while. The hosepipe usually entails the whirlwind wash. The primary issue disregarding which type of resin shed floats your boat concerns stationing the unit on solid level foundations. Timber-decking, concrete, asphalt, tarmac or paving provide ideal substrates for a shed this size, just make certain they’re level. 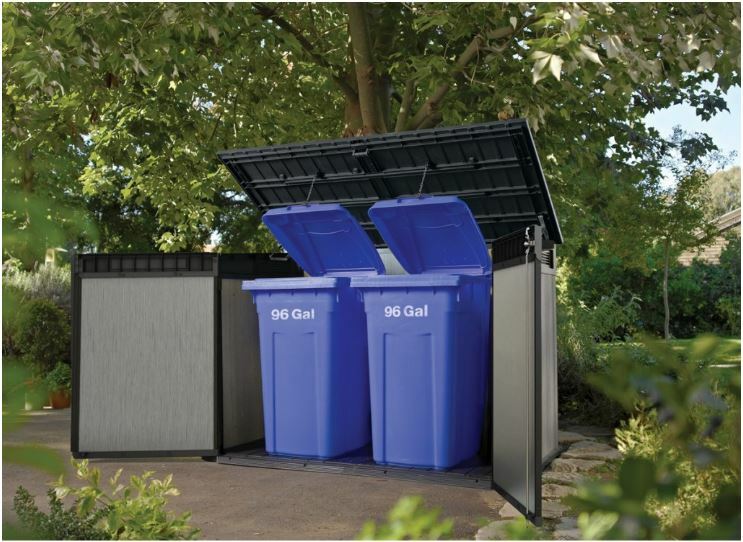 Abiding by this rule presents a solid base for the built-in floor to subsist the tensions of full wheelie-bin loads plus assembly becomes straightforward with regards to aligning the panels plumb and ensuring the doors swing vertically. There are heaps of screws however installation is very straightforward, a matter of implementing the steps demonstrated in the instructions. Once construction is finalised, there’s the option of anchoring the floor down onto the foundations through the 4 anchor placements. Resists weather decay. Will not rust or rot. Low height sheds comprising a weather-resistant resin manufacture are predominantly dominated by Lifetime, Suncast and Keter. Circumventing upkeep, their ease of installation suits inexperienced DIYers meanwhile provide a way round planning regulations besides stationing unobtrusively in restricted locations. Their versatility is gaining traction. Horizontal Sheds visually displays the low-profile shed competition meanwhile here’s a few comparable in size to the Grande-Store. 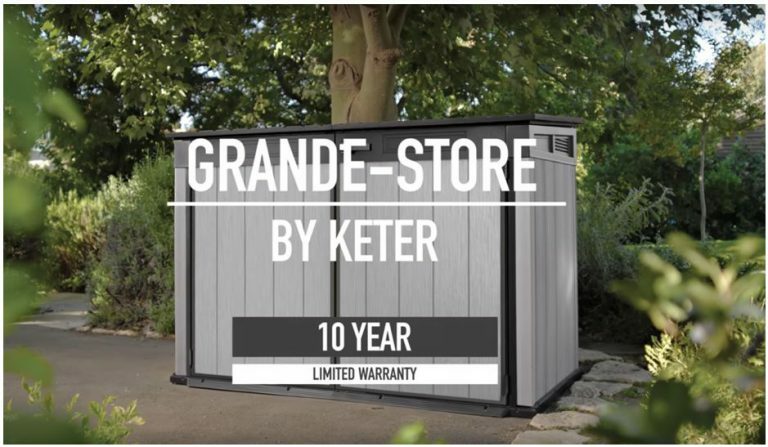 Keter’s Grande-Store provides a versatile outdoor storage solution for locating in restricted zones whilst the low height unobtrusively stations beneath the standard 6 ft fence-line. Delivering an ideal storage solution for: wheelie bins, bikes, kids toys, gardening equipment, BBQ gear, sporty stuff, dry logs & patio accessories, etc, etc. 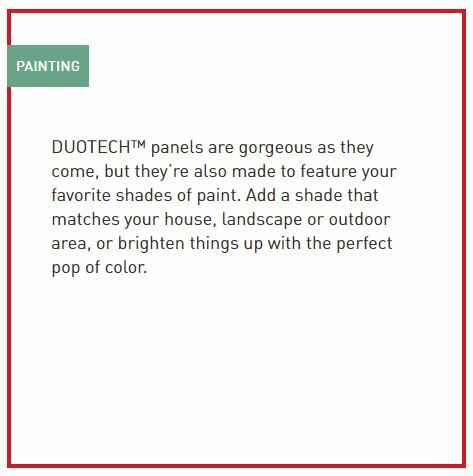 DUOTECH™ innovation stylishly simulates weathered wood & ascertains rot-resistance. Enables decorating a splash of colour to brighten-up garden surroundings or you can simply leave the rustic silvery appearance the way it displays. Low-maintenance benefits trumpet out Grande-Store’s advantage, it’s effortless to wash down without succumbing to weather deterioration. 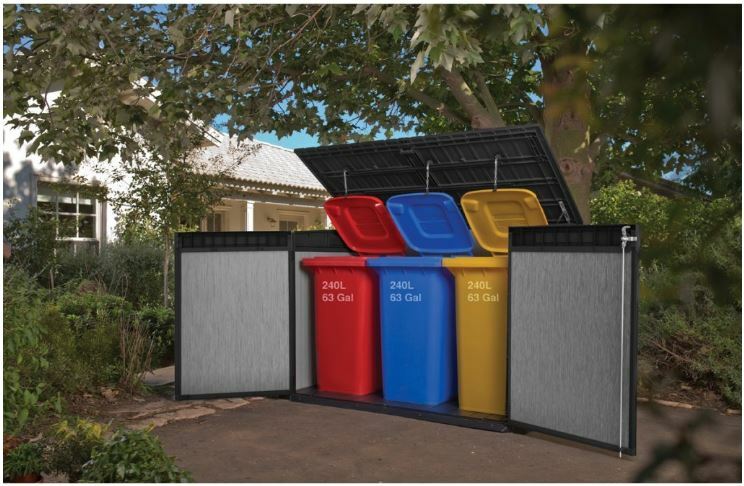 Hope Grande-Store’s low-profile design inspires triple wheelie bin storage ideas. Share your favourite wheelie trash bin store below including any queries; happy to help. Please share the Grande-Store. Thank you. Good morning i was interested in the keter grand store accommodating patio accessories 190,5×109.3 x132.5 how much it cost yon thanks . 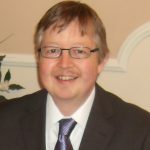 I point visitors towards the most reasonable prices and delivery in the UK and USA, here’s the link for you to inspect. Just put one of these together, instructions were clear and helpful. Excellent storage container. I want to use it to store my bike in however the handle only has to move about half an inch before the top can come up and the unit becomes insecure. I have tried a number of padlocks but none work, can you help? I do know someone who assembled the Grande-Store a few months ago and was delighted with the quality of sturdiness and assembly too. All they have done is fit a padlock very similar to the one that is shown in the video which hasn’t presented any issues. The handle clips over the clasp aligning the two holes together to enable the padlock to fit through and secure. If you watch the video in this post, the padlock design is pretty much identical to how my friend secures his. He watched this video prior to purchasing a similar designed padlock. I have one of this in my side yard. I’m impressed with the quality. It gave me the alternative to store items in my garage, without having to worry about setbacks and HOA requirements. For liking it so much, I gave one for my brother as a gift. Problem now is where can buy again? Costco have ran out of stock. Thanks for calling in to share your Grande-Store review, we appreciate your time. Planning permission regarding the average sized walk-in sheds isn’t too strict over here in the UK however I have heard it’s becoming quite strict in certain zones over in the USA, hence the popular alternative regarding these low profile sheds. This horizontal style is far easier to assemble, gets around planning issues and fits in tight spaces under the height of a standard 6 ft fence-line. I know quite a few people who have opted for a few of this style to organise their outdoor gear rather than the hassles associated with the large constructions plus their qualities are really pushing boundaries, just like this Grande-Store does. The reason it’s difficult to find sellers is due to being new to the market. This Grand-Store page hopefully provides your route, some offer free international shipping if you are in the USA. Hope this helps. Of course the content you provided also awesome such as pros/cons and assembly as well as information about the products. The Maintenance you mentioned above also very reasonable. I will definitely bookmark your site and share to my networks especially my family. Thanks for reading about Keter’s triple wheelie bin storage solution. I’m glad you found Quality Plastic Sheds website informative and that you have bookmarked for your future’s family and friends use. Obviously there are pros and cons with every product, taking the constructive criticism from feedback expressed through reviews aids this section enormously. 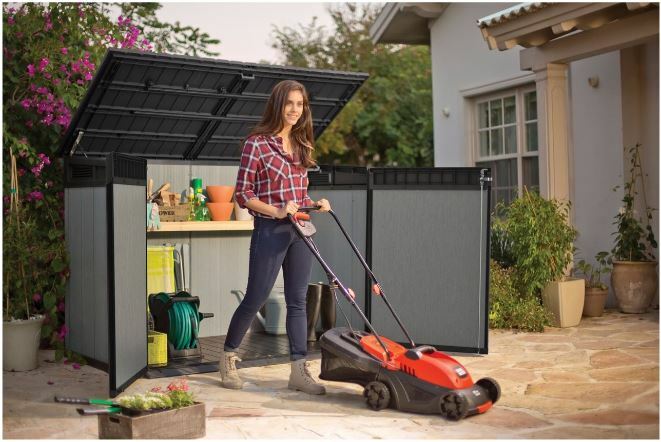 Yeah, low maintenance outdoor storage solutions are key here, it’s what this website is generally all about. 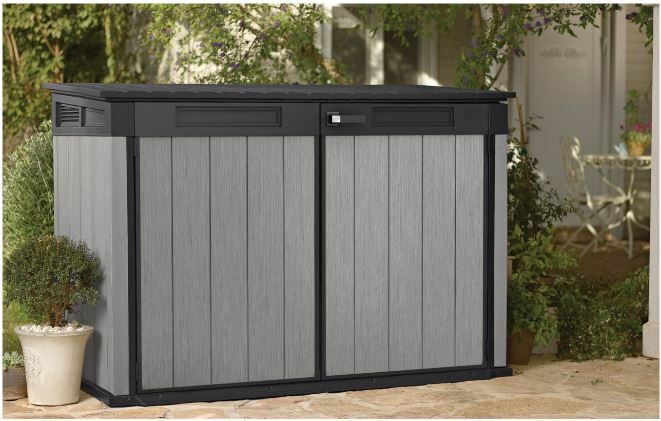 My husband and I purchased one of these Keter Grande Store sheds today and I assembled it, with my husband steadying a part for me a couple times. This shed came with about 200 screws, so I suspect it will be very solid. So far I’m really pleased, but our driveway is not fully level, so I’ll have to do a little work to level it out and get the doors to shut more smoothly. Clearly user error, so I’m happy with it. The only other issue was that a several holes they pre-drilled in metal parts were too small for the screws they said to use. Luckily, I had some to substitute. All in all, I think it’s going to be a great place to store my children’s bikes! I do like the look of this Keter Grande-Store. 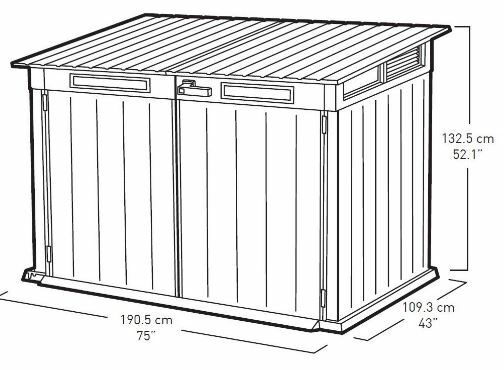 We too are interested in an additional low height shed for the patio to store the garden furniture as ours will fit according to the internal measurements making it an ideal size for the location we’re thinking. Like your assembly consisting of two people, this is the way to go, one supporting the pieces whilst the other secures with screws, it makes the process go much smoother. 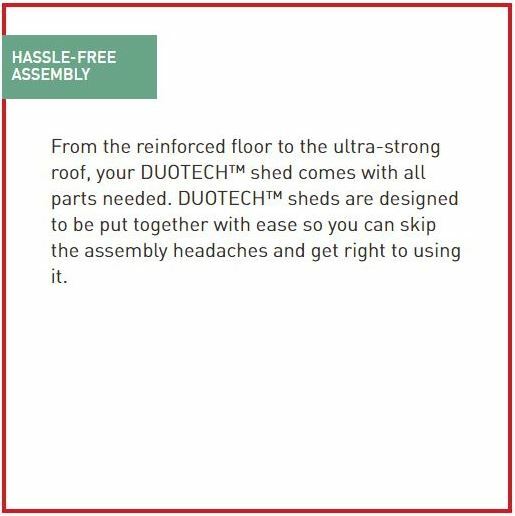 200 screws is a lot, all Keter’s Duotech range are the same but like you say this amount should increase the store’s sturdiness as something has to tie it all together. Solid level foundations really are key to any resin shed because a level base eases assembly due to all the parts aligning plumb, level foundations ensure the doors line up correctly plus there’s equal pressure from the top across all sides providing a vertical stance without any leaning pressures. Solid foundations provide a firm base for the floor to serve heavy duty demanding pressures, it’s specifically designed for this purpose as long it stands on the correct foundations. This seems to be a high-end shed. I love the fact that it uses a hydraulic piston. I find the ones I used before really heavy and bulky. I often had my fingers injured when try to lift it. This feature is must for such a large and heavy lid. It’s a great alternative to keep raccoons away from your garbage.They can do a lot of damage! Do you know if this is available in Canda as well? This Keter Grande-Store is new to the market. At present I have only seen one place offered for sale in the UK to which I have linked visitors to so in time as distribution builds I would presume it will be offered Worldwide as their other ranges are. The Grande-Store is part of Keter’s new DUOTECH range. This range started with their Oakland sheds. Due to excellent reviews and sales they have expanded their range to now include a High-Store, Deck Box, Patio-store and an extra large 7.5 x 11 ft superior shed. Yes I know which type of wheelie bin store you describe. These lids are heavy due to the expanse they cover, you find the new quality horizontal resin sheds this size are starting to incorporate hydraulic pistons like this Grande-Store uses. Yeah, I bet raccoons can do a lot of damage. I live in the UK, only squirrels can become a nuisance here, this is nothing compared with what you’ve gotta put up with. Thanks again Carolyn or commenting. In time the Keter Grande-Store will start appearing on the market. As soon as I see it available I will be linking visitors towards. Looks like a durable product. I like how much space it offers. Now to determine whether I want to use if for my lawn and garden tools or the family bicycles. Maybe I can buy two of them. I like the material they use to build these storage bins. I know they will be able to withstand the weather for years to come. 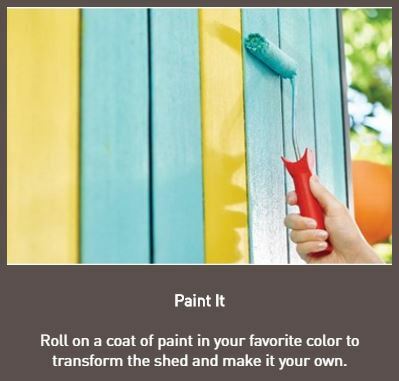 Not to mention, you can always paint them! 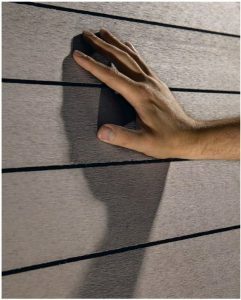 This is a new material called DUOTECH™ Keter started using this material with their Oakland range of sheds, it’s a wood resin composite that’s strong durable and weatherproof , resisting rot and decay. Since receiving a volume of sales accompanied by exceptional feedback they have expanded their range with a whole variety of outdoor storage solutions like this Grande-Store. Building regs regarding erecting large walk-in sheds are becoming quite strict in certain areas and like you suggest, a few of this horizontal design are becoming a prefered option for many wishing to escape applying for planning permission and relishing the prospect of an easy assembly, this certainly delivers. Yeah, this is the first resin style shed to enter the market with a paintable surface allowing you to add a splash of colour to brighten up your home yard. Some of Keters photos regarding painted DUOTECH™ ranges look superb, I must say. I think Keter are at the start of something big here, this range is going to be very popular. Moving is such a stressful time. We moved house about 18 months ago, what an upheaval. You seem to be living out of boxes for ages. Take it one step at a time, you’ll get there. I’m writing a couple of reviews per week at present so there’s something new every week entering onto this website. There’s some new yet very stylish designs hitting the market this year. This Keter Grande-Store for instance is brand new so the prices do vary when stock becomes low. Over time the market will settle but there’s a bit of supply and demand taking place with this model at present. 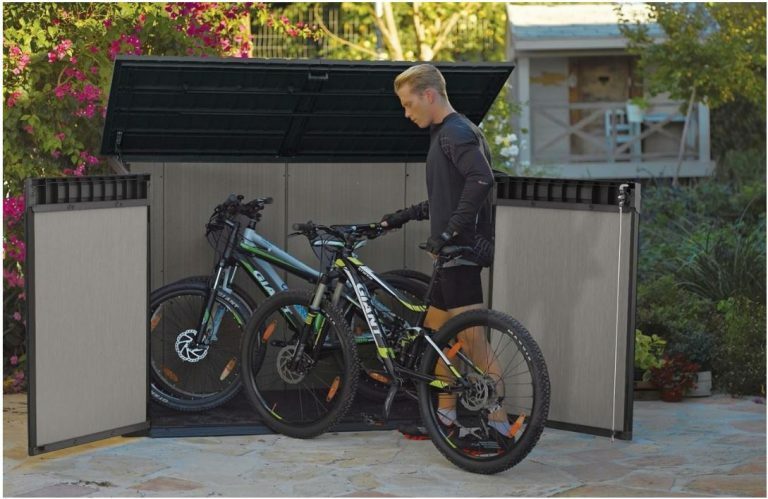 This provides so many storage solutions, like wheelie trash bin storage, patio accessories, gardening equipment, bikes and kids toys etc, etc and the reason for their popularity is the low height, easier assembly and designed to fit in tight spaces whilst serving storage needs plus the low maintenance benefits are the huge draw. Good luck with sorting out those boxes. It all takes a bit of time but you will get there.